Aer Lingus Regional flew its first flights as the new operator of the PSO (Public Service Obligation) route from Donegal to Dublin today. 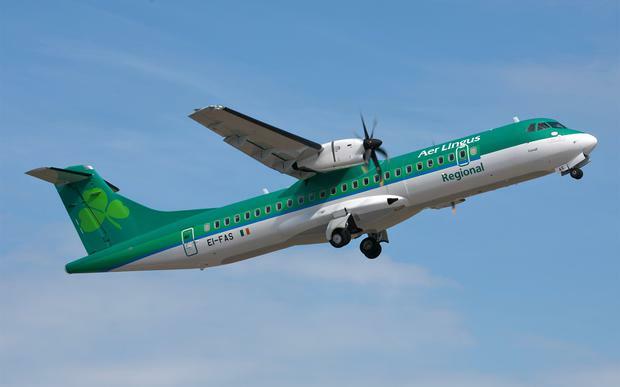 The service, operated by Stobart Air for Aer Lingus Regional, is expected to increase passenger numbers and encourage business and leisure travel between the airports. The twice daily return flights will operate seven days, year-round. The new service was launched by Minister for Transport, Tourism and Sport, Paschal Donohoe TD, who travelled onboard the inaugural flight. Last November, the Minister announced the retention of PSO contracts between Dublin Airport and Donegal and Kerry until 2017 following an EU public tendering process. "For Ireland to continue down its path of economic recovery, a well-connected transport infrastructure that connects all four corners of the country is essential." It is also hoped that the Dublin-Donegal route will create easier through connectivity for transatlantic passengers out of Dublin Airport - allowing Donegal passengers to connect to the US, and US visitors to connect to Ireland's Northwest and the Wild Atlantic Way. Passengers can now book to fly from Donegal to the US with Aer Lingus and avail of the US immigration pre-clearance facilities at Dublin. Aer Lingus Regional is also set to take over Flybe's Donegal to Glasgow service, with up to four flights per week priced from available from €34.99 each way.